Making huge waves in the indie scene with their impeccably choreographed and orchestrated appearance on Jimmy Kimmel Live! 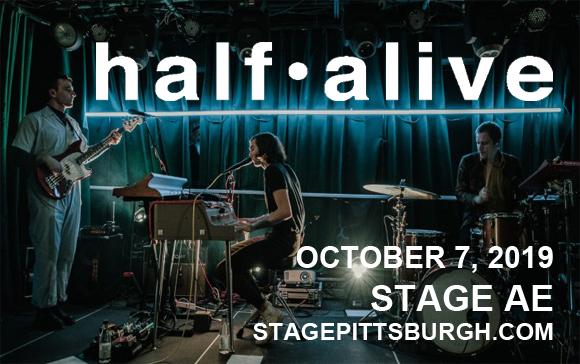 back in March this year, rising stars Half Alive are headed to Stage AE on Monday 7th October 2019 on their debut world tour! The Californian trio, offer a high-energy, theatrical live show full of danceable tunes – an absolute must-see! Formed in 2016 in Long Beach, California by lead singer Josh Taylor, drummer Brett Kramer and bassist J Tyler Johnson, Half Alive is an American indie pop band. The group formed from a seven month, 50-song songwriting project that the members had embarked on together in 2013, and made its official debut in 2017, with the release of the EP 3. The music video for the band's 2018 single "Still Feel" attracted the attention of RCA Records, who they signed with later that year. In March of this year, the band made their late-night television debut on Jimmy Kimmel Live!, and they embark on their first world tour this summer.